I love making art with my entire being, and the liberty to create by drawing from the raw inspiration and the life-force within me to connect with something simple yet precious within the viewers. The first thing I do on any given day, whether a work day or a day off, is to practice Zen meditation. I approach my in-studio work like I approach my Zen practice, with the same patience, attentiveness, and persistence, day in, day out. Gradually, I develop trust in the creative practice and know that it is an anchor that can bring me peace no matter how overwhelmed I momentarily become due to the business aspects of running RebexArt Studio. It is the peace, the connectedness, and the knowing that I hope to share through my paintings, the fruits of my creative process. The creative practice is the cornerstone of RebexArt Studio, just like Zen is the cornerstone of my being. My studio is steps away from Stanford University in downtown Palo Alto, which is the birthplace of Silicon Valley. I love the location for its creative energy, and it gives me convenient access to Stanford, where I received my graduate education. My studio has ceiling to floor windows that fill the space with natural light, and I work on a hand-made wooden easel I crafted out of scrap. It is a gift to create in such a space, and I am excited to step into the studio every morning. I create art to invite the viewers for a mind-to-mind transmission, which is a direct dialog through visual experience that occurs between the artist’s mind and the viewer’s mind. When creating, I open myself up to let go of analytical thinking and the wordy narratives of my life to simply and truly be with the colors. I let go of my limited self to have the lines and colors flow from a mystical space in my being, and know that it is the space through which we are all connected. I want my work to transcend cultural boundaries and bring forward something fundamental and pure within me, to touch something fundamental and pure within the viewers. I trust this experience to spontaneously bring forth the peace and serenity that lives within every single one of us. Art is the most direct way I have to communicate the strength, the beauty, and the freedom of enlightenment. I touch base with this existence every day, and I am grateful to have inherited it from 79 generations of enlightened Zen Masters before me. As someone who has vowed to share the fruits of enlightenment with all beings, I cherish art as a vehicle that enables me to have the possibility of mind-to-mind transmission with countless viewers. 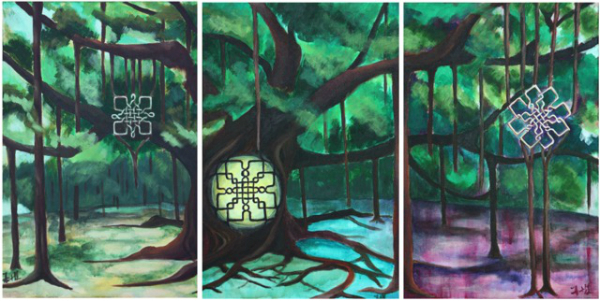 My favourite so far is the Enchanted Banyan Triptych, with the three symbols I call perseverance. The piece looks much more moving in real-life due to its size (60 x 30 inches), and it's special for the personal meaning behind it. Banyan trees have branches that drop roots to become trunks when they hit the ground. These root-trunks protect the trees from thunderstorms and typhoons in their native tropical area. Because of these roots, the trees can grow very big. As a legend has it, the entire Singapore used to be covered by one large banyan tree. Coming from tropical China, I always see Banyan trees as a source of strength in my psyche. I have created the set during the transition period after the taxing first "real" job and created the perseverance symbols from the roots and the trunk of the tree. It is an homage to our universal connectedness and a reminder to myself that there is an infinite force of strength and liberation within me, but I need to have the perseverance to access it. Interesting question. As a Zen practitioner, I undertake the training in non-attachment and enjoy the liberty this practice creates. Please let me know if you have noticed there is something I can't live without, and I will do my best to let go of it. I would call myself successful if I'm able to inspire the audiences of my art to share my dream, and to motivate them to take up enlightenment. I count myself extremely fortunate since I am surrounded by sources of inspiration all the time. I get inspired by nature, by the words and actions of the ones I love, and last but not the least, by my Zen practice. Let me answer this question by sharing a little bit about my dream. The ultimate dream I have is that we all live in a world where nobody relies on external sources to validate their ways of being, and where everybody is fully at peace with him or herself. I dream that we can all live in a world where strangers won’t hold prejudice against each other because of age, gender, skin color, country of origin, or sexual orientation. In this ideal world, our motivations stay true to our inner spark, and nobody is negatively judged for being kind. This dream is grand, and I know that we likely won’t achieve it within a few generations. So the dream of my lifetime is simply to do whatever I can to move myself and those I interact with a little bit closer to the way I dream the world to be. Creating art is a part of this dream, as I strive for my art to bring forward something fundamental and pure within me and to touch something fundamental and pure within my audience. I would call myself successful if I'm able to inspire the audiences of my art to share my dream, and to motivate them to take up enlightenment. To commission Rebecca for Zen-inspired art of your own, visit her artist page.